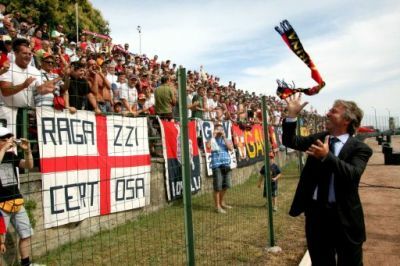 The derby Sunday-evening at 20.30 hours is completely sold out to Genoa-supporters. 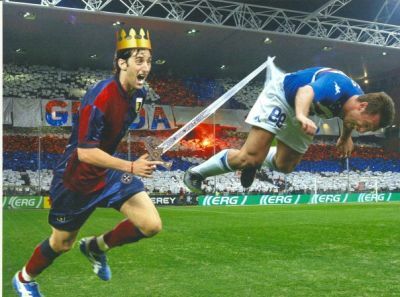 Only 1500 Sampdoria-fans still have the opportunity to watch the game in the visitors-sector. Just as last year the Sampdoria-fans can be the reason that the homederby of Genoa is not sold out, while the visitors-area is every time the first completely sold out sector if Sampdoria plays at home. No doubt which team has the best and the most supporters ! Mr. Gasperini can play the derby with an almost complete selection. Only 2nd goalkeeper Alessio Scarpi is injured, all the other players are ready to beat Sampdoria the second time this season. Forza Genoa ! Bologna-Genoa 2-0, but Europe more nearby ! Till today Genoa never lost 2 games in a row, so we all hoped and expected a revenge against Bologna. With an almost complete selection and Milito in the line-up everything seemed allright to play a good match, but we played one of the worst of this season. Just after Jankovic missed a great chance it was neo-international Bocchetti who made a big defensive error. In stead of shooting the ball inmediately out of our penaltyarea our 22 years old defender waited too long till Mingazzini arrived and then he kicked his legs in stead of the ball: penalty. Our friendly ex-striker Marco di Vaio realized the present and scored his 21st goal of the season. Only 10 minutes later also the second goal arrived: a free-kick of Adailton reached completely free Terzi at the far post who scored easily the second goal of Bologna. After the goals it was Genoa that played the game (64% ball-possession) and created several chances, but we never scored. Believe it or not, but Cassano of our rivals of Sampdoria helped us to become even closer to European football with his late equalizer against Cagliari: 3-3. Because Fiorentina beat Roma by 4-1 we lost the 4th place in the standings, but on the other hand our advantage of Roma rested 5 points. Also our 2 other concurrents: Palermo and Lazio lost their matches, so the advantage of position 7 stayed 8 points, with only 5 playrounds to go. Today at the first training after the defeat against Lazio both Diego Milito and Omar Milanetto returned in the team after their injuries. In the meanwhile Genoa-fans bought within a little more than 24 hours all 2.000 tickets of the visitors-sector of Stadio Renato Dall’Ara of Bologna. 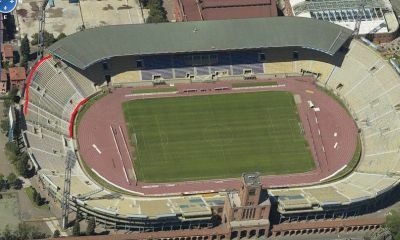 Genoa now tries to get more tickets to our fans that want to support our team in the very important match next Sunday. After 4 victories in a row without Diego Milito yesterday we missed our topscorer, who watched the match in Gradinata Nord. Genoa started very good and was several times close to the openinggoal with chances of Jankovic, Motta, Palladino, Criscito and Sculli but Lazio’s keeper Muslera saved his team every time. At halftime the score was still 0-0, but if Genoa would create as many chances as in the first half the openinggoal was just a matter of time. After 65 minutes the goal arrived, but at the other side. Lazio’s striker Zarate was faster than our Salvator Bocchetti and beat Rubinho in the far corner: 0-1. The goal broke Genoa that could not create big chances any more, so we lost the match. Luckily today Udinese beat Fiorentina (3-1), so we stay 4th in the standings. Next week Genoa plays in Bologna (18th in the standings) while numbers 5 (Fiorentina) and 6 (Roma, that beat Lecce today by 3-2) play against each other in Florence. Time to take revenge to Lazio tonight !! So far this season there are only a few matches that Genoa did not get the points they earned. The match with the most “wrong” result was in Rome against Lazio, that ended in a 1-1 draw. The annulation of the goal of Milito was one of the biggest mistakes of a linesman in Serie A this season and our Diego also missed a penalty this match. The late goal of Dabo was the biggest mistake of our improved goalkeeper Rubinho this year. 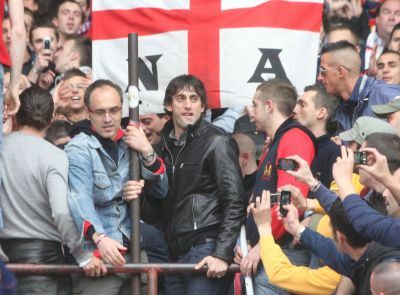 Last year Genoa lost the match against Lazio in Luigi Ferraris, so now we have to take revenge. Comparing to the match against Juventus last week only injured Omar Milanetto is changed by Stephan el Shaarawy. Besides Omar we still miss Scarpi, Paro and Milito. After A.C. Milan (2-0) and A.S. Roma (3-1), tonight also Juventus (3-2) is beaten by a fantastic playing Genoa. Since the season 1991-1992 Juventus did not lose in Luigi Ferraris, but tonight they deserved it more as ever before ! 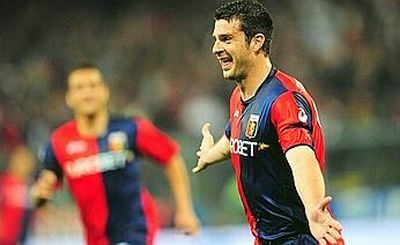 In the first half Genoa played their best football of this season and maybe the best in 17 years. After the Gasperini-boys missed several chances it was Thiago Motta who scored the opening goal in the 28th minute. Just before the shot of Motta there was a whistle in the stadium, so Juventus protested heavily against the goal and it helped: in the 45th minute referee Rocchi payed the black and white team back by giving them an incredible penalty. Matteo Ferrari with a sliding touched the ball just before Del Piero could shoot on the goal, but referee Rocchi whistled a penalty: 1-1. The whole stadium was singing: “thiefs, thiefs” to Juventus as a reference to the Moggi-years in which period many referees were payed by Juventus. During the singing it was Thiaggo Motta who scored his second goal out of a corner of Criscito by a fantastic header: 2-1, halftime. In the second half Genoa again was the best team in the field and the match seemed over when Camoranesi got a red card after a horrible action against Sculli in the 65th minute. With 11 against 10 Genoa got the best chances: a great header of Sculli was saved by Buffon and another header of Jankovic ended on the post, till in the 84th minute Iaquinta scored an undeserved and lucky typical Juventus-goal: 2-2. Genoa stayed calm and in the 88th minute the deserved winning goal was born: substitute Olivera reached the other substitute Rossi who passed the ball at the last moment towards one of the best players in the field Raffaele Palladino who beat Buffon easily: 3-2, another historical victory! Marassi almost sold out: money to Abruzzo !! Our great President Mr. Enrico Preziosi has decided that the money of all tickets (32.336 at the moment) goes to the victims of the earthquake in Abruzzo. A fantastic offer of our number 1 because Genoa-Juventus is the match with the most visitors so far this season. With a collection of the supporters before the match and the victims of the dramatic earthquake in Abruzzo in the mind Genoa plays next Saturday against Juventus the topmatch in Serie A. Despite the easter-holidays already over 31.000 fans bought a ticket to see if Genoa after AC Milan and AS Roma also can beat Juventus in Luigi Ferraris. Genoa has 6 ex-Juventus players: Criscito, Palladino, Sculli, Olivera, Milanetto and injured Paro in the selection this year and of course also our trainer Mr. Gasperini has a history inside the black and white club. Saturday all of them can show their old club that they improved so much, that Juventus made a big mistake by selling them to Genoa. Genoa surely misses the injured: Scarpi, Paro and Milito, while it is dubious if Torino-supporter Omar Milanetto can play against the other most hated team of Turin and Italy.